Earth's Internet & Natural Networking: "How I First Became Addicted To The Internet"
I was addicted to the internet long before there was an internet as we know it. I'm talking about the 'Earth's Internet' of course. Back in the late 1970s, I had a strong driving curiosity about the ancient minerotrophic hydrological cycle made reference to in the Bible book of Genesis. This is not a religious discussion here, but I have always been curious if such a system of hydrology could have existed and how would different diverse ecosystems operate under such conditions. So I tend not to dismiss what others choose to call fables, but rather assume that past descriptions could have some legitimacy, though the people of the ancient past may not have known how to explain what they saw. They did their best given the circumstances. I have another blog which deals with the geophysics of our planet, it's hydrology and what science has discovered that may or may not explain any of the references to such a system mentioned in the book of Genesis. Again, this is not a discussion of those events, but merely an explanation for what motivated me originally to delve into Mycorrhizal Networking as a viable piece of engineering for which to derive useful technologies and practical applications. For a further read on the ancient hydrological cycle, please go to this blog which also deals with Viktor Schauberger , anomalous properties of water , etc "Primary Water"
So back to basics and origins of my interest. Back in the 1970s I had no clue if such a system existed or not. So allowing it to be a given, or assuming the account was true in my own mind at least, my main focus was on the end game and not the beginning of how such a cycle would work, but the question of just how would plants react to such a system. No Rain ? Impossible! Of course I always loved forests, Botany, nature in general and how things worked, but my technical background and experience was definitely in the 'Green Horn' or 'Rookie' category. It was when I was in high school and when I was in the Future Farmers of America (FFA) program and showing my sheep at the San Diego County's Del Mar Fair that I came across something that would change my perception of how forest floor ecosystems actually worked and started looking for evidence for this. Of course there were researchers, though not as many today, out there researching answers about Fungal Networks. But there sure as heck was no internet and Libraries were long and laborious to plow through to find out info on the subject. Anyway, here is what happened. And the list of things appears to be endless. Take a look at these expensive nanotechnology light tablecloths that go for about $500 a piece. So once again, these things above were what this guy was envisioning in the future. Skeptical and admittedly unimpressed, there was one object lesson I got out of his demonstration which was amazing and mind/brain imprinting to say the least. He had this rather large cloth of fabric rolled out over a table. The cloth or fabric sheet wasn't neatly fitted on the table like the picture above, but rather is was loosely laid out with all sorts of mounds, folds and dips in what in my mind looked a lot more like the terrain of some Topographical Map. The folds and dips to me in my imagination were like peaks and valleys, ridges and low hills of a real geographical terrain or landscape in real life. It was a sort of landscape and in this landscape he demonstrated the properties of this electrically conductive material by plugging in these light-emitting diodes (or LEDs) to illustrate how the fabric had properties which allowed a low electrical conductivity which was harmless to the human touch to light up these little tiny LEDs when you plug them anywhere in that fabric. He had a box of different coloured LEDs and allowed the public to plug one in where they wished. Sure enough, there was no electric shock, even though you felt a little spooked. It was truly amazing to me but for different reasons. I looked at these LEDs not as little lights, but as little Trees in a naturally occurring well orchestrated Mycorrhizal Networked Grid to be found in any healthy ecosystem's physical landscape. I reasoned that if tree/shrub seedlings could be inserted into a rich Mycorrhizal Landscape then like the lights which were tapped into the electrical energy of the 'Smart Cloth' then these trees would have a better chance in any reforestation project or even someone's home gardening landscape. It wasn't until years later in 1990 that I decided to perform my own crude rookie experiment using real trees in the landscape. I had already heard about the successful research of former US Forest Service Scientist Dr Donald Marx who later became head scientist for Plant Health Care Inc (PHC) which even at the time was in it's infancy. Dr Marx established research of just how beneficial it was to establish reclamation projects with a good Mycorrhizal Inoculant with each tree seedling planted into an old mining site to be reclaimed. Clearly on such sites there was no longer a healthy grid. Some of my experience with a mycorrhizal fungi may be found here on one specific type called Pisolithus tinctorius at be found here on this page of the blog. What I decided to do was plant various Pine Tree (Jeffrey, Coulter, Apache) varieties on a 1/4 of an acre plot and fairly evenly spaced, but I didn't want the area to look like some organized unnatural Christmas Tree lot. There were also a couple of small native scrub oaks in this area and I left them in place. One volunteer 6 inch tree which already was present on this same location was a Coulter Pine which no doubt was planted there by the Blue ScrubJays who have a habit of incessant seed harvesting and planting these for later food storage. Unfortunately for them and fortunately for us and nature, they don't always remember where they plant seeds. To illustate the architectural layout and what I did, here an animation of a tree layout by a company called 'Voltree' (more on them in a future post) The area planted then looked something like this illustration below. After the trees were planted, inoculated with a good mix of ecto-mycorrizal spores of Pisolithus tinctorius and sort of evenly spaced apart, I allowed two years to go by before trying my experiment. It was my belief that all trees connected to a healthy, productive mycorrhizal networked grid would all be hydrated no matter where the source of the water H20 came from or was located in any topography or terrain in any environment. Take a look at those trees above with the orange coloured dots connected to each other in that animated graph or chart. This is where Voltree in the picture has applied their sensors which I'll write about in a future at another time. But for the moment, just imagine taking an irrigation drip line and placing it on one of those points of origin. After a couple hours I believed that all trees on that plot would be hydrated no matter what their position in the grid and distance from the point of water source origin. I wasn't disappointed. In a hot dry summer climate as we have there in Anza CA where winter rainy season is long gone and just before any of the potential summer monsoonal moisture drops some summer rains on the landscape, there is a phenomena of the hard dry and tight Pine Tree buds (especially the central leader bud) start to exude droplets of pine pitch all around all buds when the plant is hydrated with a drip irrigation line or a garden hose turned on with low pressure. Here's a pic of what the dry hard buds look like before being given water. And here are some pictures of what the Pine Pitch droplets begin to look like after being watered. As the minutes and hours went by in the hydration experiment, every tree eventually exhibited the same exact phenomena of a hydrated pine tree being hydrated and oozing pitch from their buds. I would wait a week and conduct the same experiment all over again , but the next time I'd place the irrigation drip line in a different position or location in the networked grid as illustrated in the Voltree graph. The trees all flourished and clearly there was indeed a healthy underground unseen network of the mycorrhizal grid. Today those trees are approximately 7 to 10 foot tall. I sold this property back in 2001 and I visited it last summer of 2011 with my wife from Sweden. Sadly a renter who was a tree trimmer and rented it in 2002-2004 took out many of those trees to have a place for parking his equipment. The property was sloping and this location where the trees were was the only fairly level spot for him to create space. Needless to say I was a bit stressed when I saw they were gone, but hey, it's not my place or business anymore. So whatever. However, here are some pics of the trees that still exist from that Mycorrhizal Networked Grid Project. And as I pan around with the camera to the left of me photographing this Jeffrey Pine , you will see three of the evenly space tree examples. In fact these trees are part of what My son Jared and I planted when we came back from a Nursery in Corona, CA. One of the trees my son took back to his home in San Marcos CA and planted, nurtured and generally babied alone. I took some Pisolithus tinctorius spores down with me from the Mountain property and inoculated that tree about a year later. The tree was maybe neglected a bit, but was huge the last time I saw it. If I get a picture of it, you'll notice it may be a little bigger than these as it is a Torrey Pine and faster growing when young. The tree to the left in this picture below is the ScrubJay planted Coulter Pine I mentioned earlier. You'll still see some equipment parked in the back ground, but these are the newer owners. This would be an ideal project for any student out there to under take, not only the actual trees, but illustrating the grid work of the 'Smart Fabric' & LEDs example. Feel free to use any and all methods mentioned above or on this site. 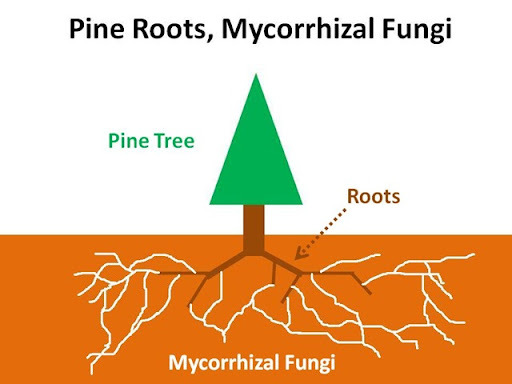 There are certainly other applicable mycorrhiza species around the globe and this planting scheme will work in any country on the planet given the correct species of mycorrhizae with the correct host tree or shrub. There appears to be many visitors to these pages from several countries and if you have any questions about your area, please ask them in the comments below. Thanks again.